"Unlike some of his Berlin contemporaries, Friedrich Kiel did not stick to a drily academic imitation of historical composition techniques. His style opended up to the innovations of the time. It is among his merits to have breathed the spirit of Romanticism into the circle of Berlin academics. Thus we find in the monumental Missa Solemnis a style that integrates linear, contrapuntal thought into the tonal aestetics of the late 19th century. Thus Friedrich Kiel, in contrast to Beethoven, places the chorus at the centre of his solemn Mass and thereby creates a massive sonority which, in combination with the dense polyphonic complexity, makes great demands on the recipients. 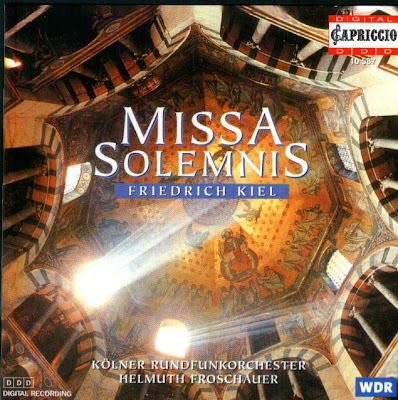 The Missa Solemnis of Friedrich Kiel is a clear stylistic confession of a Protestant articulated on the Basis of the Catholic liturgy. Since, however, large-scale Masses in that phase of musical history had in any case long been seculrised, the composer saw himself to no conflict of belief, for this work also clearly has its place in the concert-hall." The Compact Disc was released by Capriccio, 1998, (DDD). Capriccio 10 587.